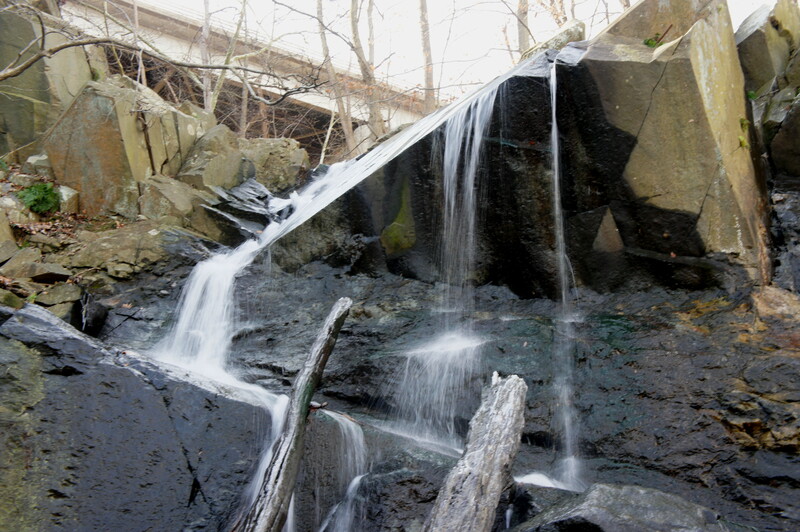 Arlington, Virginia’s Windy Run Trail offers a brief, scenic jaunt with four creek crossings, culminating at the base of one of the Washington, DC area’s best waterfalls. 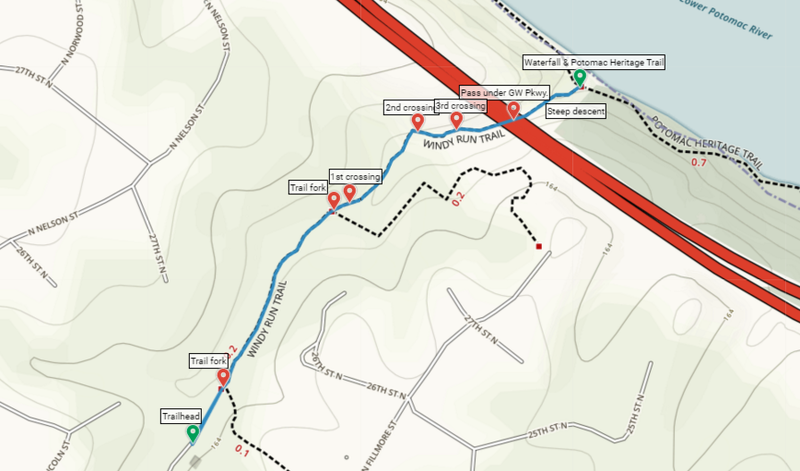 Starting at N. Kenmore Street, the nearly half-mile trail drops more than 120 feet; most of it comes at the end, when the stony path descends a sandstone bluff, terminating at the Potomac Heritage Trail on the banks of its namesake river. 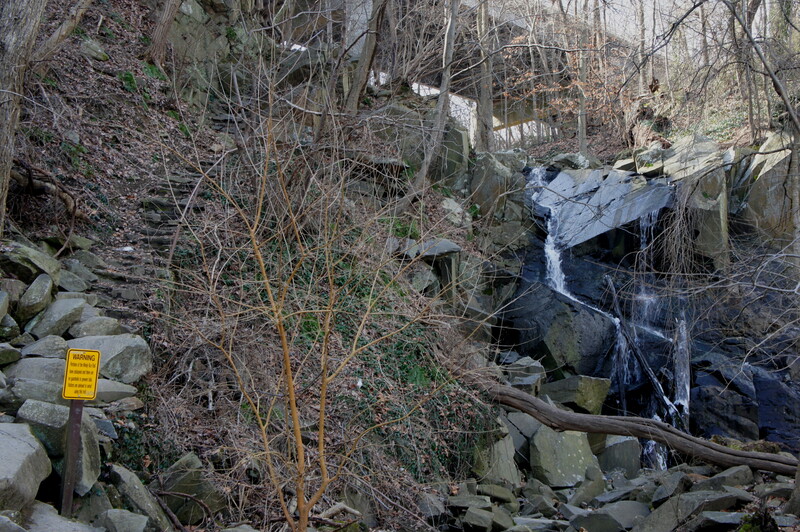 Visiting Windy Run Falls is a short but excellent outing—a hidden gem situated just over two miles from the Rosslyn Metro Station. Beyond, the trail offers its first peek at Windy Run, down below on the left. 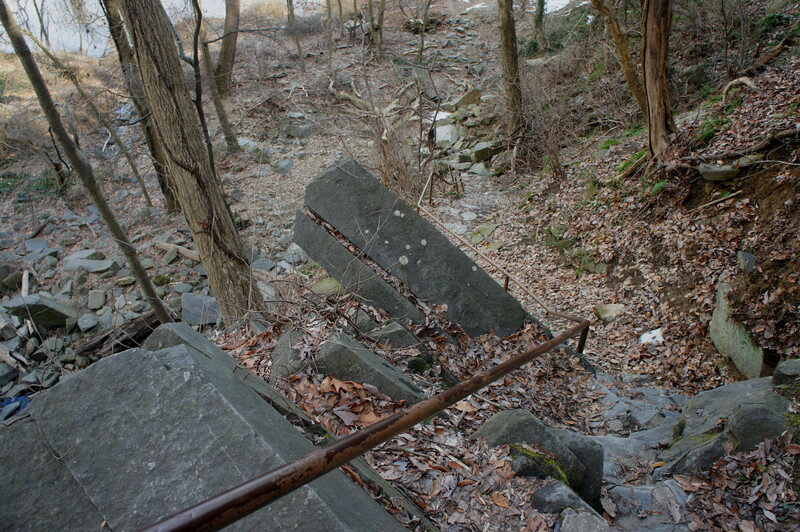 With an aqua railing on the left and stone drainages on the right, the trail bears northward then drops down a stone staircase to reach creek level. A couple hundred yards from the start, the Windy Run route intersects with two spur trails on the right; stay left. Steps beyond the second junction, the trail dips and makes its first traverse of Windy Run. All four creek crossings of Windy Run are short but require some careful footing and rock-hopping to avoid a cool plunge. Reemerging on the left bank of Windy Run, the trail continues downstream for 150 yards then crosses Windy Run again. (Note: The lofty bridge up ahead provides passage for cars on the George Washington Memorial Parkway.) Don’t get too used to dry land, as the route quickly veers back through the creek for a third time. 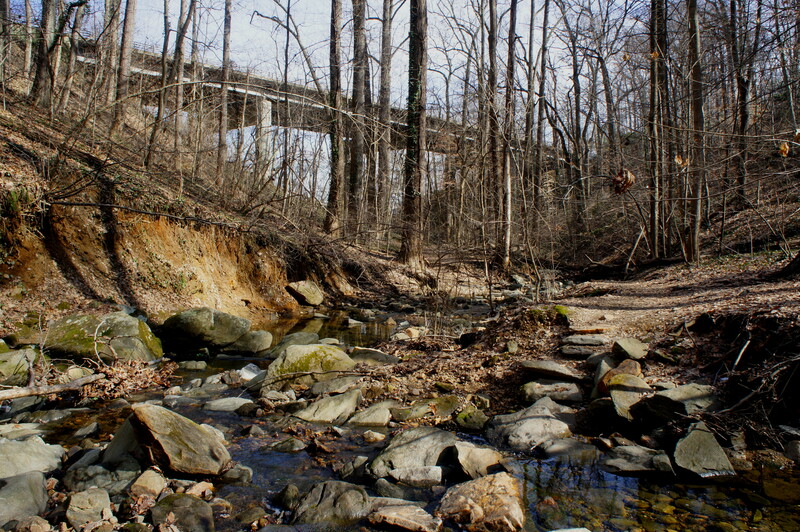 Ten minutes from the trailhead, the Windy Run route passes under GW Parkway then begins the steep and unforgiving descent to the Potomac River. After a modest initial drop, the route crosses Windy Run a final time, just upstream from the lip of Windy Run Falls. Caution is a must as the trail drops sharply down a staircase reminiscent of Lord of the Rings. Fortunately, the trail affords one luxury that hobbits don’t get—a rusty but sturdy metal railing for support during the knee-buckling descent. 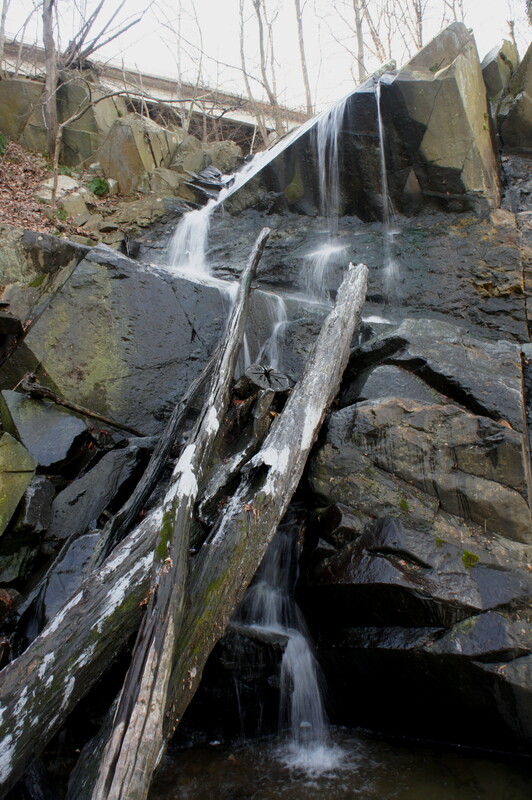 The bottom of the rocky traverse ushers in the end of the hike, with views of the Potomac River and Windy Run Falls, as the path merges with the Potomac Heritage Trail. Take a rest or snack break at the falls—not the world’s finest but surprisingly impressive considering its distance, just a stone’s throw from a major U.S. city. During a dry summer, however, it may be little more than a trickle—making spring or winter the best time to visit. 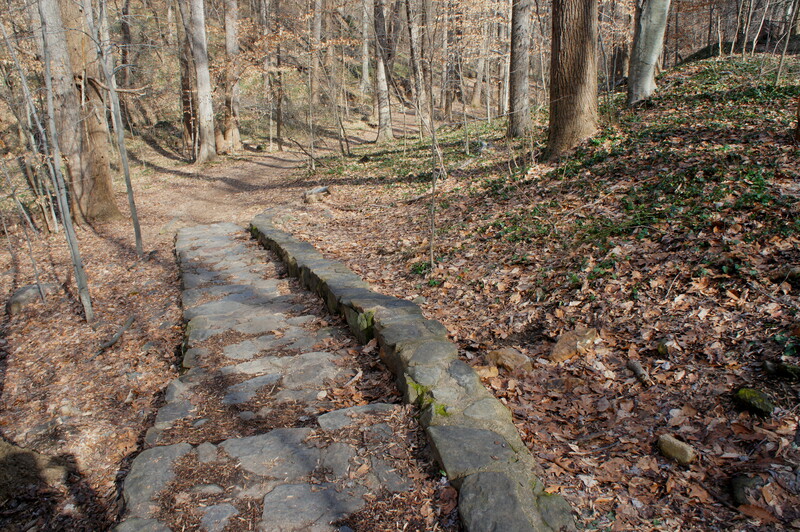 Continue right or left on the Potomac Heritage Trail—or retrace your steps back up to N. Kenmore Street. Allot around 45 minutes from the out-and-back to Windy Run Falls. This entry was posted in Arlington County Parks, Moderate Hikes, Virginia and tagged Arlington, George Washington Memorial Parkway, GW Parkway, Potomac Heritage Trail, Potomac River, Virginia, waterfall, Windy Run, Windy Run Falls, Windy Run Park, Windy Run Trail. Bookmark the permalink. How do you pronounce the “Windy” in “Windy Run?” Is it a short i as in breezy or a long i as in curvy?